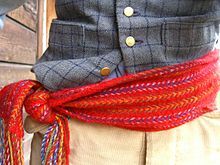 The ceinture fléchée [sɛ̃tyʁ fleʃe] (French for "arrowed sash"; English: L'Assomption sash or "arrow sash") is a type of colorful sash, a traditional piece of French-Canadian clothing of the 19th century (of the Lower Canada, Canada East and early confederation eras). The Métis also made ceintures fléchées and use them as part of their national costume. While the traditional view is that the ceintures fléchées is a French-Canadian invention, others propose a different view on its origin. According to Dorothy K. Burnham who prepared an exhibit on textiles at the National Gallery of Canada in 1981, and published an accompanying catalogue raisonné, this type of finger weaving was learned by the residents of New France from the indigenous peoples. In Quebec, this wool sash was used by men to tie jackets around their waists to prevent the cold from creeping in. It was a both practical and fashionable accessory, worn by both the bourgeois and the habitant classes. The width of a traditional belt can be 15 centimetres to 25 centimetres, and its length can easily be more than 2 metres. The ceinture also had a practical use: it helped prevent back injuries or hernias amongst the fur traders of the time. Three styles of the sash. From left to right: Assumption, Charlevoix and Acadian. It is adorned by an arrowed pattern and was worn around the winter coats of the time. It is also a symbol of the Lower Canada Rebellion and the Quebec Winter Carnival, as it is worn by the festival mascot, Bonhomme Carnaval. Imitations are sold and seen throughout the carnival. The belt is represented in a number of artistic creations, such as the illustration Le Vieux de '37 by Henri Julien, the painting L'Assemblée des six-comtés by Charles Alexander Smith and the song Mon Pays, suivi du Reel des Aristocrates from néo-trad musical band Les Cowboys Fringants. The arrow sash was part of the traditional costume of the Lower Canada habitant at least from 1776 on. Although at that time the British visitors and the German mercenaries who noticed its presence called it a "coloured sash". That is what Thomas Anbury called it when he wrote his account of travel after his visit to Charlesbourg and Beauport in 1776. In 1777, Charlotte Luise de Riedesel, arriving from Germany to rejoin her husband, Major-General Frederick, related that when she met him in Chambly, he was wearing a red and blue sash with fringes over the traditional Canadian costume to keep him warm as he was still suffering from influenza. That same year, a German mercenery lodged at Sainte-Anne related how people in their home were weaving the colored sashes using their domestic wool. In 1778, E.V. Germann made a drawing showing clearly a Canadian peasant wearing his sash, the design was a chevron. That drawing is a proof of what is written by others. Elisabeth Simcoe who lived in Quebec city in 1792 for more than a year wrote about the Canadians, "(…) their coats are tied round with a coloured sash." The design of the sash continued to be modified and finally became a standard type that was mainly produced ine L'Assomption region around 1835, according to the historian Mason Wade. The HBC agents who came to collect them at Fort Assomption named these sashes lassomption or l'Assomption sash in the accounting books. Despite its great popularity in Lower Canada as well as in the West, there was a slow-down in its production. That was probably due to the decline of the fur trade in 1870:52 and in part to the suggestion of the parish priest Tancrède Viger to the weavers, to stop producing, considering them very badly paid for their work. Sashes were worn by snow-shoers and by retired fur traders who took residence in Montreal and area. Many artists left drawings, paintings and sketches confirming the popularity of the sash. A few women continued weaving sashes and ensured the handing-down of the craft to other generations and the current one. Marius Barbeau was very interested in ceinture fléchée trying to find its origin. He did not, but left many clues to learn more of its presence, popularity if not its origin. E.Z. Massicotte, archivist at Montreal City Hall and folklorist, continued Barbeau's research and concluded: "la ceinture fléchée un chef d'œuvre de l'industrie domestique du Canada". Yet no such type of diagonal weaving is known elsewhere in the world, let alone in France. It seems that Native Americans were quick to improve their techniques upon the discovery of brightly coloured yarns that they did not have access to previous to contact, and often took apart fabrics to reuse the yarn for sashes, and a photo of an example is shown in Burnham's book. Since 1968 many persons learned to hand weave ceintures fléchées though not all kept weaving sashes, many taught the craft and are spreading its knowledge. Many popular singers, folklore dancers and especially Bonhomme Carnaval are contributing to make it known to visitors and in various countries. Many steps are required in the creation of a ceinture fléchée. First, the craftmaker picks the wool threads that they need. The threads have to be long enough so that the person who will wear the sash can pass it twice around the waist. The craftmaker needs to add the length of the fringes at each end of the belt. The fringes are used to tie the arrow sash. After that, the craftmaker organizes the threads and weaves them to create designs of lightning bolts (zigzags), flames (lozenges) and arrow heads (uusually in the middle of the sash). Finally, to make the fringes, the craftmaker finishes the belt by making twists or braids with the length of thread that remains. In the creation of a perfect ceinture fléchée or the intricate beadwork designs that would adorn various artifacts a hard callus develops on the tips of the finger. This is referred to as a "needle finger". It was considered a "rite of passage" for young girls and is acknowledged by the matriarchs in the family. ^ Jean Provencher (2003). Le Carnaval de Québec: La grande fête de l'hiver. Éditions MultiMondes. pp. 4–. ISBN 978-2-89544-047-5. Retrieved 30 October 2012. ^ Anbury, Thomas, Voyage dans les parties intérieures de l'Amérique , pendant le cours de la dernière guerre. Paris, Briand, 1790, 2 vol. ^ Riedesel, Charlotte Luise de, « Letters in Memoirs » Die Berufsreise nach Amerika. Briefe von Frederick Riedesel. Berlin, Haude and Spenersche, 1827, version anglaise, New York, 1925, 348 p.
^ Simcoe, Elizabeth (1965). Innis, Mary Quayle (ed.). Mrs. Simcoe's diary. Macmillan of Canada. p. 45. ^ Lambert, John (1814). Travels through Canada, and the United States of North America, in the years 1806, 1807, & 1808 : to which are added biographical notices and anecdotes of some of the leading characters in the United States. London. Retrieved 19 September 2016. ^ Mason Wade, L'encyclopédie du Canada français à nos jours 1760-1967. Traduit par Adrien Venne avec le concours de Francis Lubeyrie, Montréal, 1963, 3 vol. ^ Neering, Rosemary (1974). Fur trade. Toronto: Fitzhenry & Whiteside. ISBN 9780889021792. ^ Marius Barbeau, Ceintures fléchées, Montréal, Éditions Paysana, 1945, 110p. ^ Burnham, "L'art des étoffes", p. 36. ^ "Assomption Sash". Encyclopedia of French Cultural Heritage in North America. Retrieved 2014-02-23. Gottfred, J. "Ceinture Fléchée : Finger Weaving a Voyageur Sash", in Northwest Journal, Vol. VI, pp. 1–5. Beauvais, Michelle (2007). Braided Assomption Sash: so called "ceintured fléchée" or "arrowhead-design sash" pp. 37–42 in Space, Time and Braid published by Texte. Inc. Author Makiko Tada and Hiroyuki Hamada, printed in Japan (ISBN 978-4-925252-21-8). Bourdeau-Picard, Michelle (2004). An Alluring Symbol: The Arrow Sash in Canadian Art. Catalogue of an exhibition held at the Musée d'art de Joliette, Québec. May 21 to Aug. 22, 78 p. (ISBN 2-921801-28-0). Speiser, Noémi (1983). "The Manual of Braiding" published by the author (Basel) Switzerland. Reedited in 1988,1991,1997. Noémi Speiser is an international authority on Braids having researched the subject for over 35 years. Burnham, Dorothy K.(1981) The Comfortable Art: spinning and weaving in Canada. Chapter 2: Indian and French Braiding, published by National Museum of Canada. Burnham joined the staff of the Royal Ontario Museum in 1929 as a "second assistant draftsman" and became its first curator of textiles in 1939. Association des artisans de ceinture fléchées de Lanaudière inc. (1994). Histoire et origines de la ceinture fléchée traditionnelle dite de L'Assomption, collaboration avec le département d'ethnologie de l'université Laval à Québec. 125 p. Édition du Septentrion: Sillery, Québec. (ISBN 2-89448-002-4) (preview). Bourdeau-Picard, Michelle (2004). Un symbole de taille: la ceinture fléchée dans l'art canadien. Catalogue d'une exposition tenue du 21 mars au 22 août au Musée d'art de Joliette, Québec. 78p. (ISBN 2-921801-28-0). Genest Leblanc, Monique (2003). Une jolie cinture à flesche. sa présence au Bas Canada, son cheminement vers l'Ouest, son introduction chez les Amérindiens. Les Presses de l'Université Laval, Québec QC. Science humaine et sociale. 178 p. (ISBN 2-7637-7858-5). LeBlanc, Monique (1974). J'apprends à flécher, Montréal: R. Ferron Éditeur, 127 p.
Emery, Irene,(1966). The Primary Structures of Fabrics, The Textile Museum Washington, D.C.
Burnham, Dorothy, K., (1976). Braided "Arrow" sashes of Quebec. Emery Roundtable at the Textile Museum of Washington, D.C. (with the presence of Noemi Speiser). Dorothy Burnham is an historian in textile, Canada. She start working at the Royal Ontario Museum in 1929 as a second assistant "draftsman" and became its first curator. She is an authority in textile history. Burnham, Dorothy K., (1981). The Comfortable Art: Tradition Spinning and Weaving in Canada. Chapter 2. Indian and French Braiding, National Museum of Canada, Ottawa. En français, L'art des étoffes: filage et tissage traditionnels au Canada. Chapitre 2. Indian and French Braiding, National Museum of Canada, Ottawa. Speiser, Noémi, (1983). The Manual of Braiding. Published by the author, Basel. Switzerland. Reedition:1988-1991-1997. Noémi Speiser is an international authority on Braids, having researched the subject over 35 years. Monique Genest LeBlanc : « Une cinture à flesche » Sa présence au Bas-Canada, son cheminement vers l'Ouest, son introduction chez les Amérindiens. 2003, Les presses de l'université Laval, Québec. Wikimedia Commons has media related to Ceinture fléchée. Sash Weaver, personal Web site of sash weaver Carol James, author of the book Fingerweaving Untangled, containing instructional videos and other resources. Étchiboy, Métis company that weaves sashes on looms.